One of my favourite parts of visiting Honduras was learning about traditional Honduran food. The Caribbean side of Honduras is beautiful with some tasty food to boot. The only problem is that you have to go out and search for great typical food in Honduras. 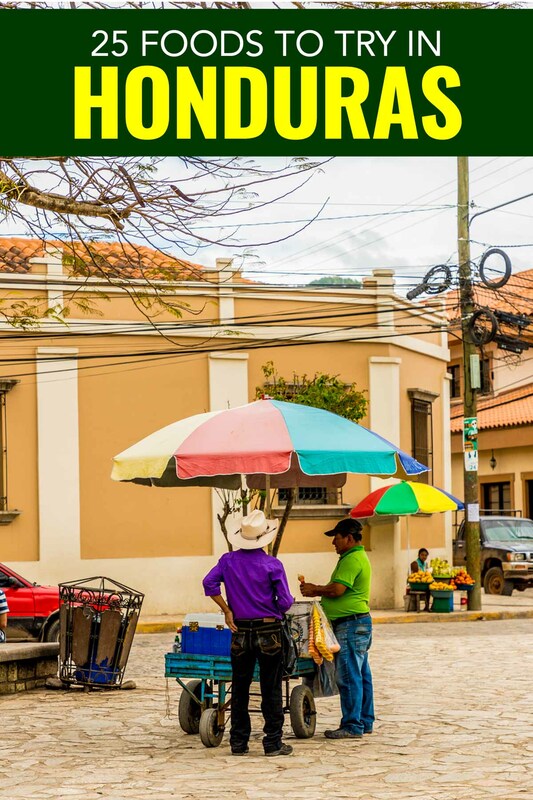 In Honduras food is tricky, there seems to be a prevailing thought all tourists want western food and that burgers and nuggets will fit the bill. To be completely fair, I only spent 8 days in Honduras and much of that was to scuba dive in Utila and see the ruins in Copan, both tourist destinations. Although I searched high and low for the best Honduran food, asking locals where they eat in Utila, I think a more fair representation would be to see more of the country. Honduras cuisine is different from its neighbours in Central America. 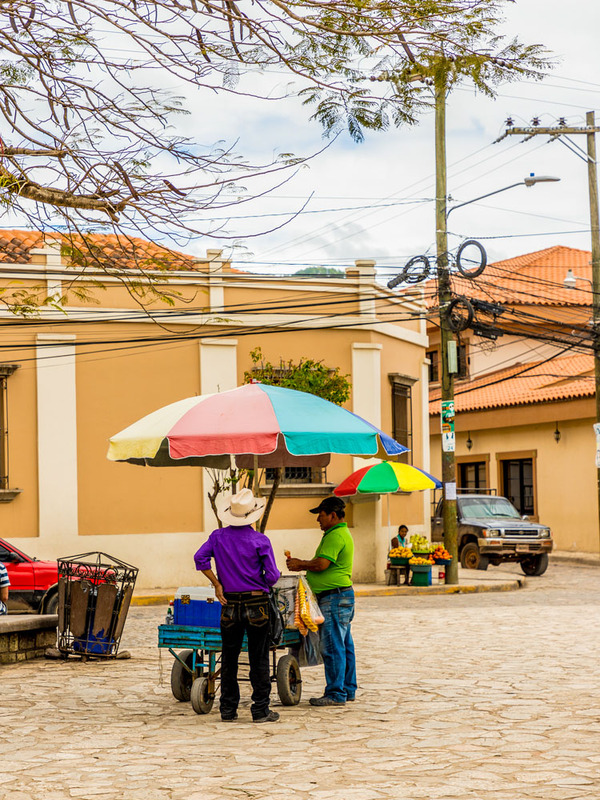 You can see the influences of Spanish colonization, African immigrants, neighbouring Caribbean countries and the indigenous Lenca population, which exists in Honduras and El Salvador. Much like in Mexico, tortillas are present at almost every meal in Honduras. It’s as common as eating bread for Canadians and Americans. However, in Honduras you’ll find corn tortillas more often than flour. Eating corn, according to the Mayan Lenca heritage, is divine, and so Honduran food often includes corn tortillas. It is so important that the ancestors also believed. humans were created from corn. 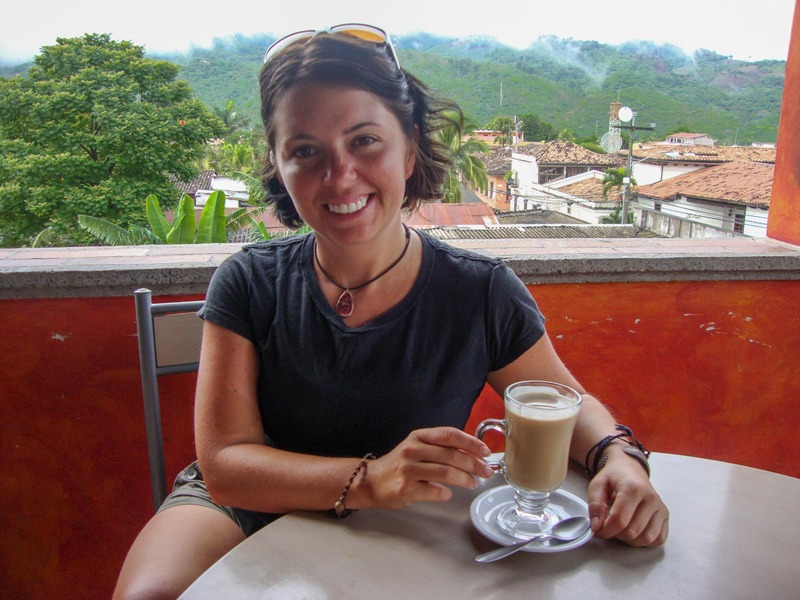 Traveling and eating in Honduras is a bargain. While travelers may splurge on a scuba diving package, it’s possible to eat well on traditional Honduran foods. Backpackers can cut costs to less than $10/day to eat in Honduras and yet eat three full meals a day. Yes I know I said most of the tortillas are corn, but baleadas are actually made from flour tortillas. And while they are not the official food of Honduras but they should be as they are found everywhere. The flour tortillas begin with mashed fried beans, cabbage and salty cheese; a variety of other ingredients are added and then it’s folded and thrown on a grill. They are considered a snack but are large enough for a light meal. 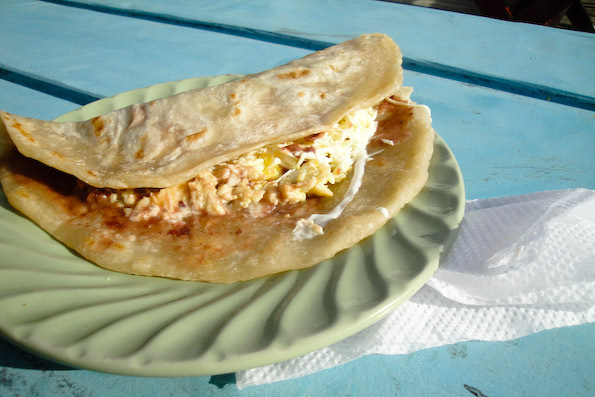 My favourite Honduran breakfast was a baleada with scrambled eggs, beans and tomato sauce with a bit of salty cheese. I have a special spot in my heart for baleadas because I wasn’t a huge fan of Honduras at first. I arrived in La Ceiba at night and was looking for a quick dinner in Honduras. Our hostel owner told us not to go to Carnaval because we’d likely be robbed. The streets were dark and there were people passed out on the grass and others who should have passed out long ago. La Ceiba felt ominous and it was weighing on me. Bt the mood quickly changed when I passed by Burger King and Pizza Hut to find women selling food in a row of street stalls along abandoned railroad tracks. Of course my first baleada was pork and friend chose a vegetarian baleada with avocado. I loved the smokiness of the outdoor grill permeating the crispy tortillas. They were on a dollar each so we bought another one each for the road. 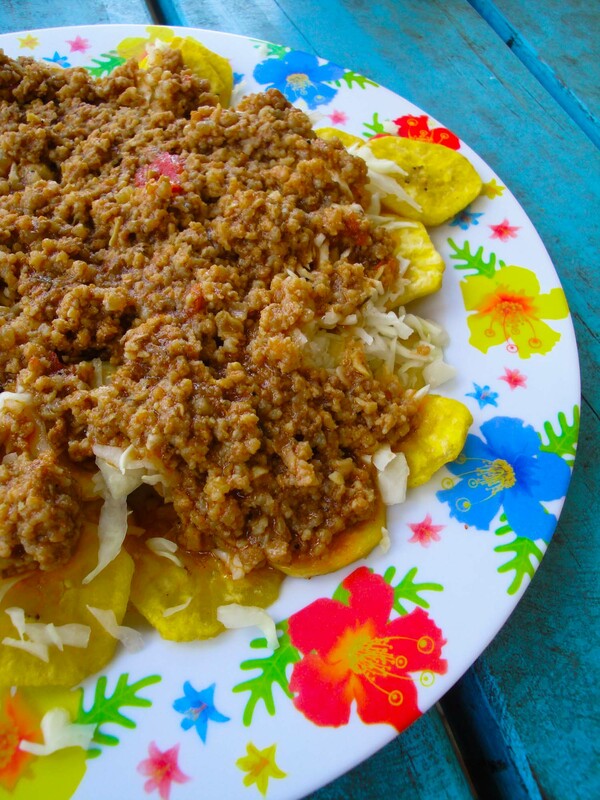 Plantains are a staple of dishes in Honduras, and this wonderful treat seas a layer of the fried plantains topped with cabbage and ground beef to make for a filling and tasty meal. Tajadas are fried plantains and the traditional Honduran dishes require you be in tune with your carnivorous side and they were perfect after scuba diving in Utila. I’ve been trying to eat less meat lately but I couldn’t pass up the local dish that topped fried plantains with ground beef and cabbage. The mix of starch and meat reminded me of comfort food like shepherd’s pie. One of the heavier dishes, it would be a solid choice for hangovers and the meaty/salty taste was a fair pairing for the sweetness of the local rum and cokes. 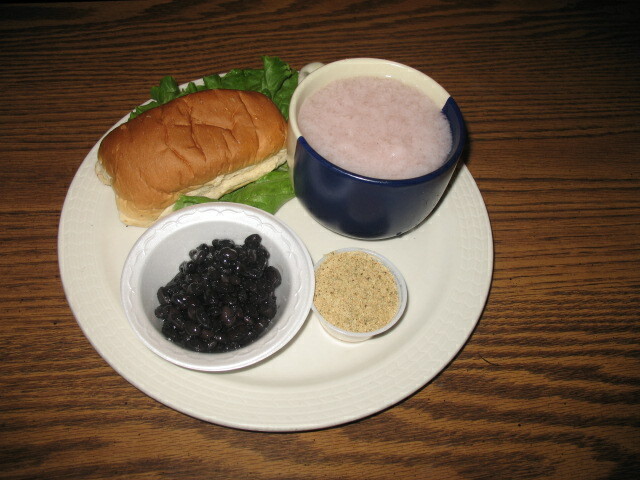 This translates as typical breakfast in English and can be found throughout Central America. This Honduran breakfast made me love breakfast again. I don’t like sweet food and so breakfast and brunch has never been my thing. I don’t want to eat pancakes or waffles. 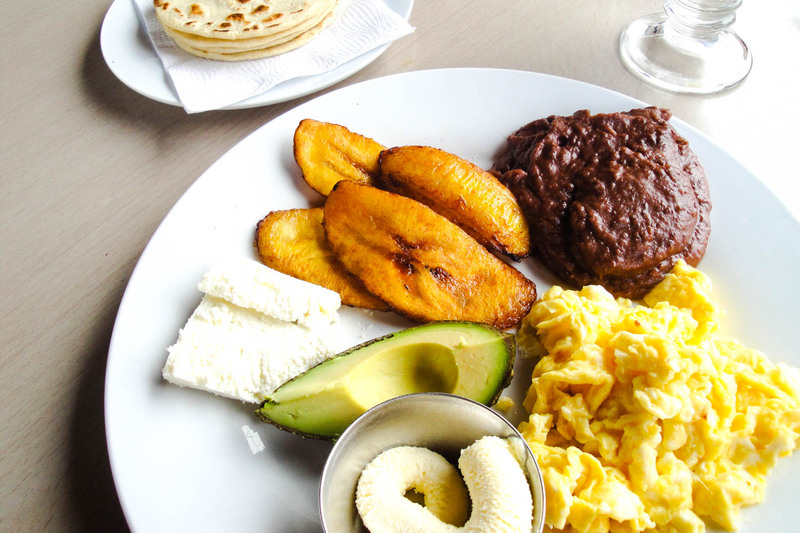 But in Honduran cuisine breakfast includes scrambled eggs with mashed beans, fried plantains, tortillas, avocado and a slice of salty cheese. It is a wonderfully filling start to the day. Although Nicaragua borders Honduras, the quesillo snack in very different in the two countries. In both the snacks are named after the quesillo cheese. In Nicaragua the cheese is placed on a warm tortilla and pickled onions, sour cream and salt are added to the top. However, in Honduras the cheese placed between two tortillas and deep fried. It’s served with tomato salsa. Roasted meat meals are found across Latin America and the most famous are the carne asada in Mexico and the Argentinean asado. Similar to the Yucatacean grilled pork dish poc chuc, in Honduras cuisine the meat is marinated in spices and sour orange before grilling. Carneada is unofficially an official dish of Honduras and while it is usually associated with special occasions and parties at someone’s house, you can find it in many Honduran restaurants. Come hungry as it’s usually served with salsa, sweet platains, salty cheese, beans and of course, tortillas. Finally, no food vacation would be complete without evening snacks. Grilled corn isn’t unique to Honduras. It can be found in most country fairs or rib fests in Canada. Yet itis never with the combination of mayonnaise and salty cheese. I know the mayonnaise sounds a bit suspect to eat on the street. But you too can double fist corn on the cob for less than a dollar. So it’s worth just trying it. While most places will have one variety or another of grilled corn, the amazing thing about the food in Honduras is the mix of mayonnaise and salty cheese on the corn itself, which is a flavor worth trying. Honduras is the home for soup lovers. In fact, I could write an entire post on Honduran soups. It was difficult to limit this post to a few, but I chose the best ones. This dish is so famous that one of the country’s most famous pop songs has been written about it. Sopa de caracol is a culinary treat. It is a conch chowder cooked in a large pot with vegetables and a dash of hot pepper sauce. While you can find different versions of conch soup in Central America and the Caribbean, conch soup in Honduras usually has coconut milk, green plantains and often yucca. I am always hesitant to eat conch because while it’s delicious in many countries it is not sustainable. But good news! According to Seafood Watch, the most sustainable conch is in Honduras so go ahead and order the soup. This soup is one of the most popular in coastal areas of the country. It is filled with plenty of shrimp and often other fish too, with cassava, peppers and onion, along with coconut milk for a creamy taste. 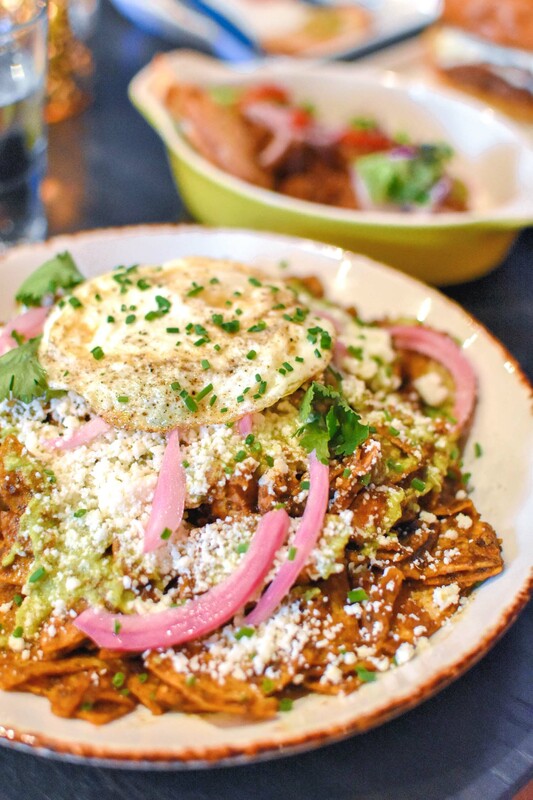 Most people know chilaquiles from Mexico but they are also a typical Honduran food. Fried tortillas are softened in a spicy tomato sauce and then topped with layers include chicken, cheese and hot sauce. There can be several layers added before and sour cream is often added to the top. Honduran enchiladas are very different from Mexican enchiladas. 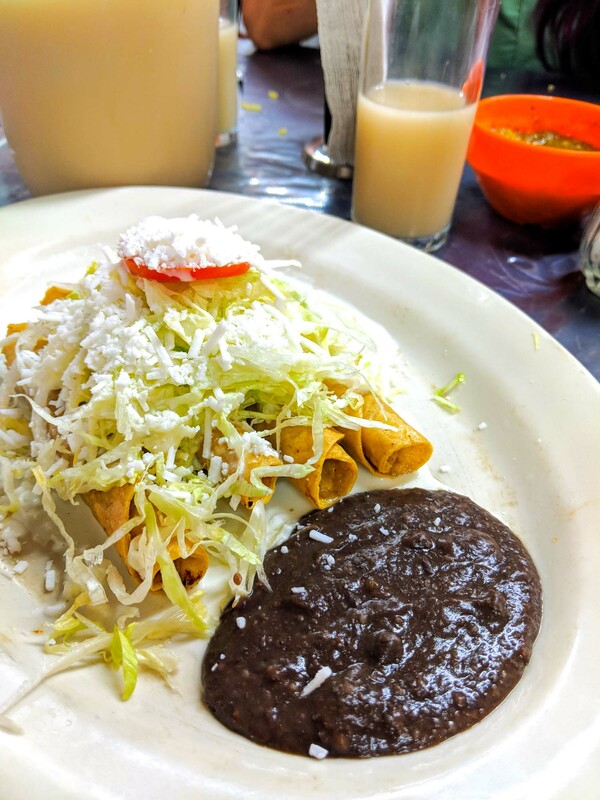 Instead of stuffing meat, beans and cheese in a soft tortilla and covering it with sauce, Honduran enchiladas are more similar to the Mexican tostada you’ll see in places like Playa del Carmen. A tortilla is deep fried and then used as the base for a variety of toppings including ground pork meat, raw cabbage, a slice of boiled egg and finally tomato sauce. Another snack resembling the Mexican tostada, tortillas are deep fried then topped with refried beans, cheese and sometimes meat, such as chorizo. In Honduran restaurants it is similar to a cheese fondue as melted cheese is served in a clay pot. This Honduran food is a specialty of the western region of the country, and particularly in the area around the Mayan site of Copan, and this warming cornflour soup is perfect for the cold mornings found in the area. 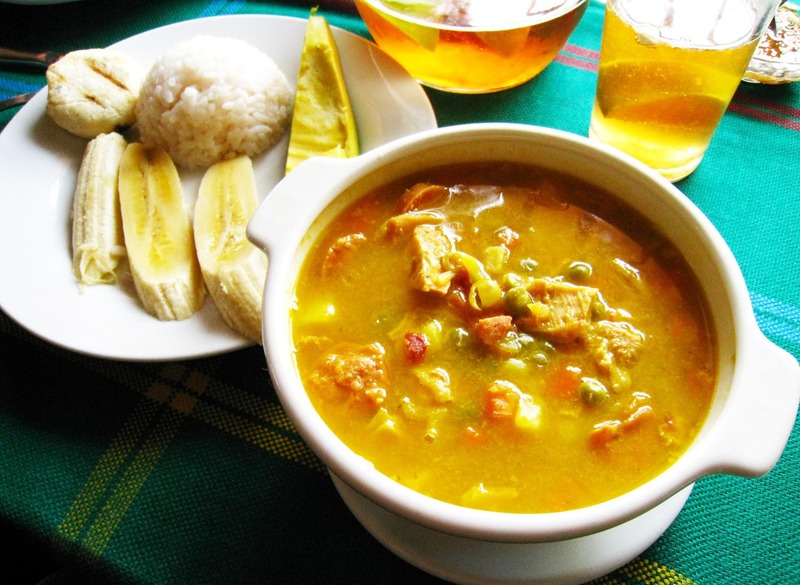 Machuca is a fish soup from the Afro-Latino Garifuna culture, which is found throughout Honduras, Guatemala and Belize. It is a simple but delicious soup combining coconut milk, fish and peppers. Sometimes it may also include conch or shrimp. A typical Honduran soup made with beef broth, squash, yucca and common Central American vegetables. Any combination of meet can be used to it’s common to see beef olla or pork olla. A variation on the tripe soup enjoyed across the region, this makes full use of the cow with tripe and cow’s hooves for a really meaty taste, which goes well with the onions, tomatoes and green peppers in the soup. You can find this tripe soup throughout Latin American and the Caribbean. Each country makes it slightly differently. In Mexico it is more commonly known as menudo and is considered a hangover cure. This deep brown brothy soup may look fairly unappetizing to some, but it is so delicious. A red bean soup that is made by soaking and boiling the beans with boiled with peppers, pork ribs and onions to make a wonderfully hearty broth. This Honduran food is an amazing fish stew dish is used for celebrations in the Garifuna culture. It is most common to include conch but often includes several different types of fish and shellfish, plantains and coconut. 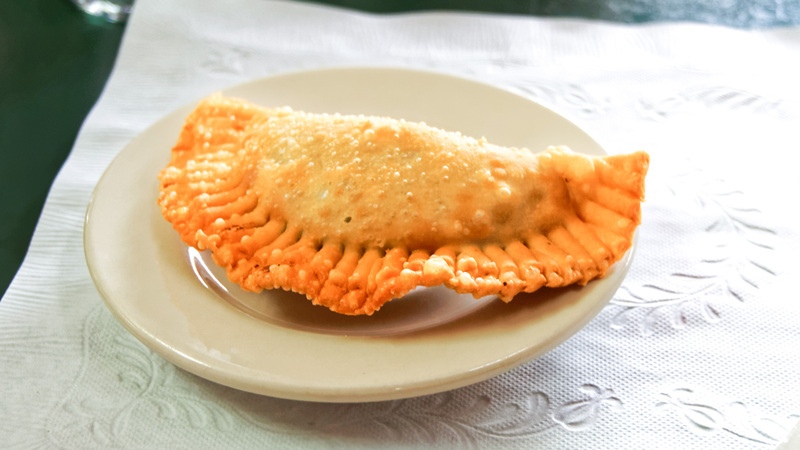 In Spanish “ito” means little and so it’s not surprising that pastelitos are a smaller version of the Brazilian pastel. 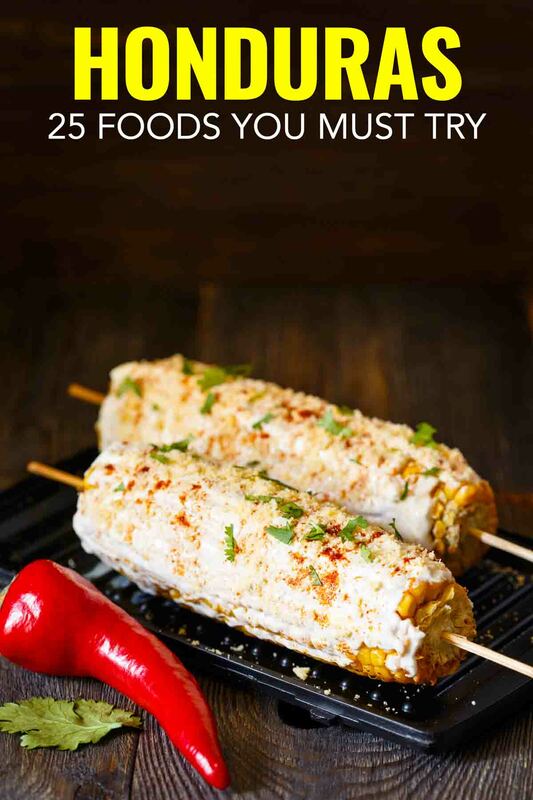 Pockets of corn tortillas stuffed with ground meat or vegetables are a tasty snack, and they are a popular treat and are usually served with a salad and grated cheese. They are also known as empanadas in Ecuador and other South American countries. Traditionally eaten during the Christmas period in Honduras, tamales are similar to those found across Mexico and South America. These tamales use a masa dough and may be combined meat, potatoes and other vegetables, and occasionally served with a spicy sauce. 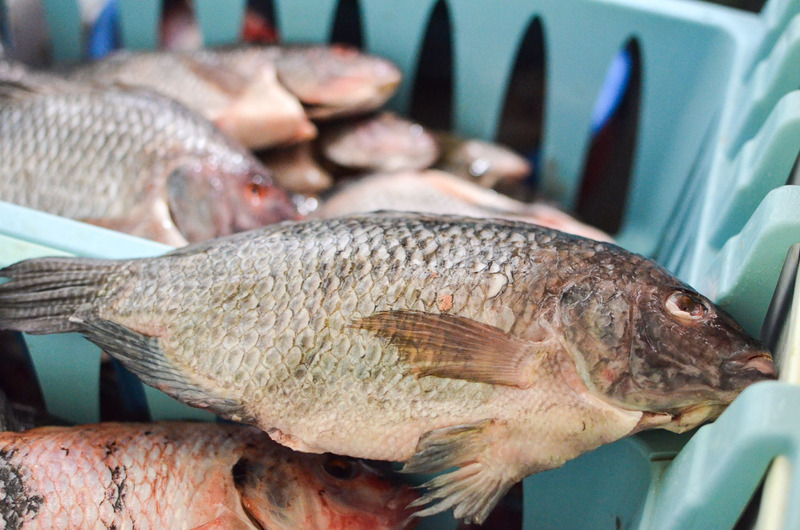 Yojoa Lake is one of the most popular destinations in Honduras, the native fish in the lake is tilapia. Here it is very common to get the Honduran version of fish and chips, which are fried yojoa fish caught fresh from the lake, served with with tajadas plantain chips. Hondurans prepare ceviche with plenty of lime juice and coconut milk, which you don’t see in all ceviche recipes. The Honduran ceviche recipe traditionally doesn’t call for chili peppers so if you prefer a bit of spice ask for some hot sauce. It is often accompanied by salty crackers, avocado and sweet potato. A typical Honduran food, coconut bread is common in many Latin American coastal culturals, including Brazil. This is literally a delicious bread flavoured with coconut, and is a beautiful golden brown colour that has an amazing aroma, and is best eaten fresh out of the oven. 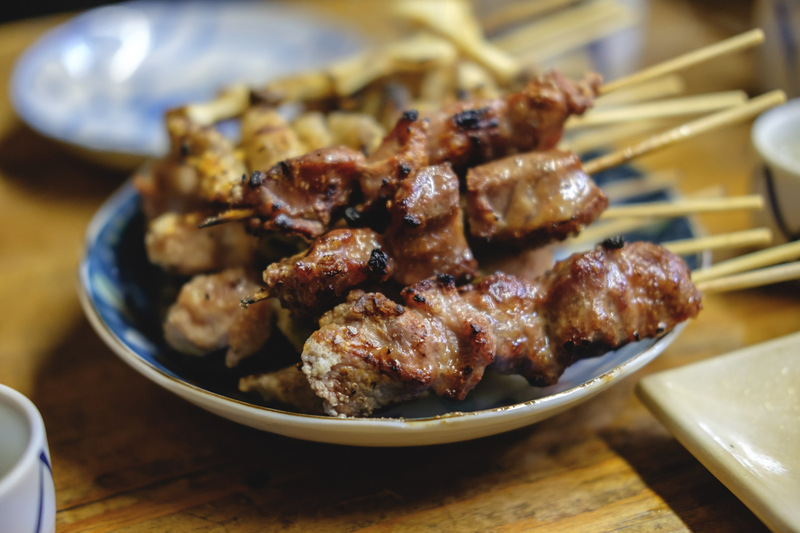 Skewers of meat and vegetable chunks that are usually cooked over the barbecue. Pinchos americanos are little bites often enjoyed at parties or social gatherings. They are originally known from the Basque region in Spain and are best known in Latin America in Honduras. In Peru they are called anticuchos and often use animal off-cuts or organs known as offal, such as grilled heart. Tacos fritos are very similar to flautas or tacos dorados in Mexico. Tortillas are simply prepared, stuffed with beef or chicken, and then rolled into a tube and deep fried. They are usually served with a sour cream and ‘salad’ which is usually just a handful of shredded cabbage and maybe a slice of tomato. A simple dish of chicken and rice that you can find throughout Latin America. In Honduras you will usually find that the rice is mixed with a variety of diced vegetables. And the chicken is usually cooked with cilantro in Honduras, which is different from other countries. What Honduran food did I miss? Let me know in the comments below! Yum & Yum! I love that Central American Breakfast! And the corn? They do that in Mexico too but with cayenne pepper & lime juice – amazing! We actually asked for cayenne pepper but they gave us an odd look and said they had none. I also did not see any pepper with fruit there either, which was sad as I really love pineapple and chili pepper. In Honduras it’s not common for people to eat spicy food. The only exception is “chile cabro”(literally translated as goat pepper, land is very hot) which is mainly used on the north coast and bay islands. Breakfast is my favorite meal of the day, and that one looks truly delicious! At one point did Geof try to take all the kernels off the grilled corn in one bite? That would of been a much better picture. Been in Honduras for two days and already I have had TWO baleadas (including one super baleada)… me gusta. I’ve been loving the food here in Honduras so far! My favourite is that carne asada with tortilla, that many street sellers sell. Even the chicken soup here is amazing! We don’t experience the magic of Baleada yet. Does it need to be eaten when it’s still hot? Twice we buy it, both were just warm. The baleadas are all over the place with a multitude of fillings. For the most part you’ll see women cooking them to order at night, obviously that’s the safest but also we picked them up warm at the bus station and had no problem with it. Tajadas look like nachos… after reading further to realize they aren’t I am quite upset. Tajadas are delicious any way you make them. The thinner they are sliced the more they crisp up almost like a potato chip. Starchy salty goodness. Elote con mayonesa y crema is one of my guilty pleasures! I love your food photos. So well done with that 50mm lens. I found the food in Honduras not be particularly flavory. While these simple dishes are fun and perhaps different from what we normally eat, I don’t think they can rival food in other countries. I’m obsessed with different countries’ corn on the cob. Mayonnaise? Wow! Mayo and cheese is amazing, although I asked for some hot sauce but alas they had none. Did you have tajaditas? Tajaditas are similar to tajadas but made with green bananas. They are often topped with meat, cabbage (vinegar) and graded salty cheese as well as other sauces. Tajaditas are my favorite Honduran food!